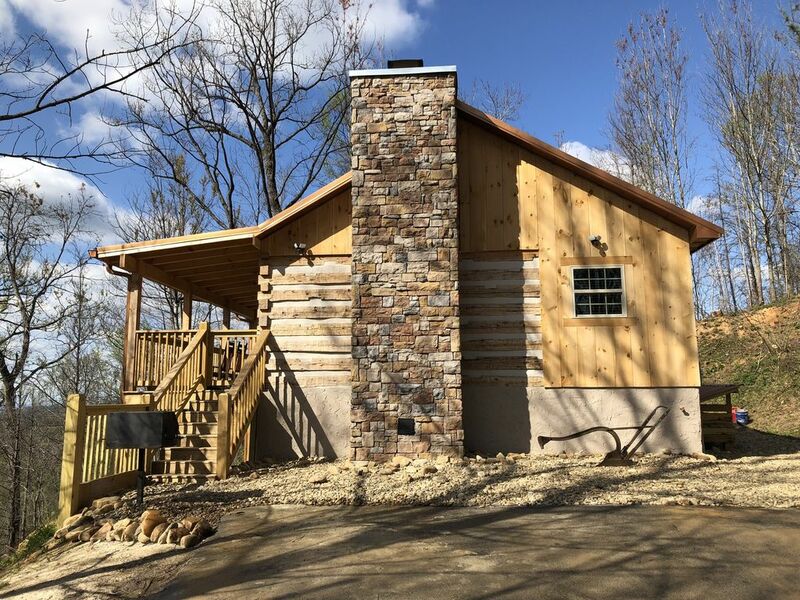 An authentic antique log cabin, transported and rebuilt in the Timberidge community of Gatlinburg, the cabin sits at the end of the road on a hill with spectacular views. Yet, it is only minutes to downtown Gatlinburg, Pigeon Forge, and the national park. This cabin will make you feel a world away with the hand hewn logs from the 1800's and stacked stone chimney. Sit back in the rocking chairs on the front porch and take in the wonderful view of the smoky mountains or relax in the hot tub after a long day of hiking and shopping. Inside, you will find with the rustic feel of the cabin are all the conveniences of today. A fully equipped kitchen and wood burning fireplace for those romantic evenings spent in the cabin, a king sized Beautyrest pillow top bed, as well as free WIFI will provide the amenities you deserve on your vacation. Cabin also has a full sized washer, dryer, and hi def TV. The beauty of nature abounds at Honeymoon Hideaway. Many guests have seen the family of bears that stroll through the property from time to time. Take in the beautiful long range views and listen to wild turkey calls in the morning while you drink coffee on the porch in your rocking chair. We fell in love with the Smoky Mountains due to the natural beauty, wildlife, and many attractions the area has to offer. We have managed rental properties for over 15 years and our goal is to make your stay as relaxing and enjoyable as possible. Please feel free to contact us with any questions you may have. We absolutely love the community where this cabin is located. Each cabin sits on almost an acre and is secluded from the others in the neighborhood. We found that to be a rarity compared to most cabin areas that are stacked on top of each other. The authentic logs that were used to rebuild the cabin give it a romantic charm that make it stand out from cabins in other communities in the area. Although secluded, the cabin has a great view and is easily accessed with vehicle and very close to Dollywood, Pigeon Forge, and downtown Gatlinburg. Spectacular long range views - you can even see The Island ferris wheel at night! Built out of antique hand hewn logs from the 1800's. We loved being on top of the mountain. The kitchen was well-equipped. We especially enjoyed the fireplace and hot tub. We would love to return! This was exactly what we were looking for. Loved sitting on the porch listening to the sounds of nature while reading a good book; relaxing in the hot tub watching the sun set while sipping wine; and enjoying a warm fire at night when the temperature dropped. The cabin is beautifully decorated and has the essentials needed for your stay. As some have noted before, it is best to arrive during daylight. The road is steep and narrow with a few switchbacks on the way up. Directions provided are excellent and host is very responsive. Beautiful cabin!! We loved our stay and would love to come back and stay again. Cabin was clean. A beautiful view off the front porch. Very relaxing stay! Would stay here again and again. First time down to Gatlinburg and it was a great cabin to stay in. We will definitely be back! Check-In-3:00 pm Check-Out-11:00 am Minimum booking age is 25. Rates are subject to change. There is a one-time $75 dollar cleaning fee added to total cost. Please read rental policy. Deposit verifies acceptance of rental policy.